Would you believe me if I told you these muffins are exceptionally good for you and taste amazing too? I know that you know that I know that this is not always the case with “healthy” baked goods. But these delicious little muffins break the mold on that one for sure which should come as no surprise since my Aunt Marilyn gave me the recipe and I know that you know that I know that her recipes are always pretty killer. 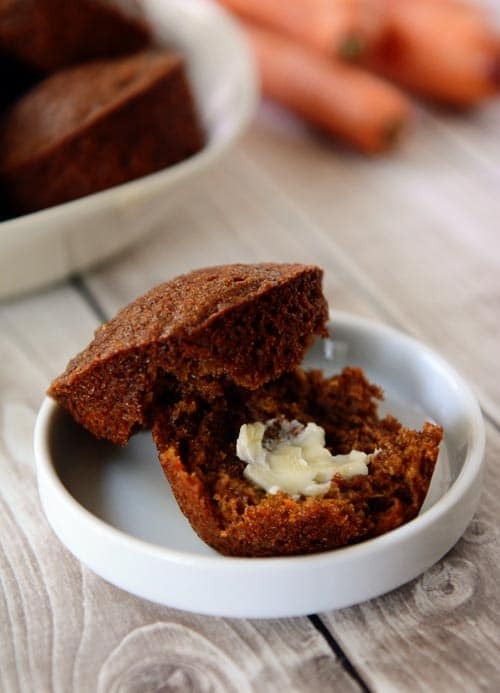 Packed with superfood after superfood, they have no added sugar beyond the thick, syrupy molasses and are bursting with quinoa, whole wheat, carrots, chia seeds, and lots of cinnamon. They may not win any awards for looks but since they aren’t going to clog your arteries, either, I’d say we can look over that little hangup. I tend to keep my freezer stocked with a few of our favorite muffins-fit-for-breakfast-and-snacking, including these Refrigerator Bran Muffins, Healthy Applesauce Oat Muffins, and Banana Blueberry Muffins (among others, depending on my mood). When asked to grab a bag full of muffins out of the freezer in the morning lately, the kids have been going straight for these. Who am I to argue? We like them with a little dab of butter (ignore the “won’t clog your arteries” comment above, thankyouverymuch) and a teensy drizzle of honey, but they are exceptionally tasty without any adornment, too. Aside from breakfast, I’ve taken to throwing a few of them in my bag when we are out on long walks (you know, for when that uphill stretch is looming before me and the loaded-with-toddlers stroller and a power muffin break is needed stat). They’ll also be a perfect addition to our school lunch routine since my kids don’t mind a muffiny type lunch now and then. Keep in mind, these are definitely and very certainly a muffin. As my Aunt put it when sending me the recipe: “Don’t expect a cupcake and you won’t be disappointed.” Truer words hath never been spoken. A muffin it is! And a healthy, delicious one at that! Preheat the oven to 350 degrees F. Lightly grease two 12-cup muffin tins and set aside (or you can line them with paper cups). In a large bowl, whisk together the coconut oil, applesauce, molasses, eggs, and vanilla. In a medium bowl, whisk together the flour, baking soda, baking powder, salt and cinnamon. Add the dry ingredients to the wet ingredients and mix lightly with a wooden spoon or rubber spatula; there should still be a few dry streaks. Fold in the quinoa, carrots and chia seeds until just combined (don't overmix). Fill the muffin cups about 3/4 full and bake for 18-22 minutes until the tops spring back lightly to the touch (or a toothpick inserted in the center comes out clean). Let the muffins cool for 2-3 minutes in the tin before gently sliding out onto a wire rack to cool completely. I prefer using white whole wheat instead of red whole wheat flour since it has a lighter texture but either will work fine just take care to use a light hand when measuring the flour since overflouring will make the muffins dense and dry. ﻿Also, make sure the cooked quinoa you use hasn't been cooked in broth; just water and maybe a pinch of salt. You must try these!! I admit I was skeptical even as I was scooping them into the muffin cups. I even halved the recipe because I didn’t want to waste twice as many if I didn’t like them. But they are delicious!!! Made them precisely as the recipe instructs and wouldn’t change a thing!!! Making the other half batch as we speak!! Thanks for a terrific recipe!! My FIL makes a muffin that is very similar to this except he slathers the tops in cream ,cheese frosting. It takes the healthy edge off, but they are tasty and super filling! Absolutely delicious! I added chocolate chips to mine, and they were to die for! Healthy, yummy and filling. My family ate them up! Love these sturdy muffins. Not too sweet. Perfect for the first thing in the morning. This recipe is perfect for me! It turned out sooo nice and delicious. No, it doesn’t taste like your typical sweet muffin, but I don’t want it too! I want a moderately sweet tasting, satisfying, healthier, easy to grab snack to avoid skipping breakfast. I love whole grains but don’t care for quinoa…..I know…..crazy!! So what other grain could be used in this?? Hi Janet, you could try adding soaked chia seeds or extra flour (or maybe even oats). I’ve never subbed out the quinoa, so you’ll have to experiment a little. What kind of molasses do you use? I used blackstrap and the muffins had a very strong molasses flavour. Hi Joanna – I use regular, unsulphured molasses; I’ve never tried this recipe with blackstrap. Made these like the recipe said except didn’t have chia seeds. Threw in some golden raisins. Pretty good for a healthy muffin. will make again maybe with coconut or nuts. Thank you! The first time I made these I discovered that I’m not a fan of molasses! I also over stirred and they came out really dense. I made them yesterday with two adjustments and they’re awesome! I did half whole wheat flour and half chickpea flour (to increase the protein) then I substituted honey for half of the molasses. Just made the power muffins last night. I have to say I was a bit unsure at first, but they smelled so amazing when done I could hardly wait to try them! My kids and husband loved them, as did I!! This is definitely something I will keep making because it is delicious and healthy! Thank you for sharing! These are amazing, I’m honestly not surprised though. I’ve made 5 meals from your healthy category over the last 5 nights and every one was amazing. All 5 kids ate all 5 meals. That’s saying something. Is it totally inappropriate to say I love you? Because I do. I really, really do. Wow, I made these exactly as the recipe was written and they are amazing! I wouldn’t substitute or change anything! I will make these often! Thanks for a great website with amazing new ideas! 1. Replaced coconut oil with more applesauce (for a total of 1 cup applesauce). 2. Decreased molasses to 1/2 cup and added 1/4 cup honey. 3. Only used 1/2 cup shredded carrots and added 1 cup shredded zucchini. They turned out amazing. Even better the next day! I put the rest in the freezer for snacks. One muffin and I’m powered for hours. These muffins are absolutely delicious. I will continue to make them over and over again! So the molasses flavor was too strong for me and I usually like molasses. And I didn’t like the quinoa texture in them. I don’t think I’ll make them again. I feel like this is a first fight with a new boyfriend because everything I’ve made from your site in the past few weeks has been fabulous! (And I promise I followed the directions exactly on these.) Oh well. These are delicious! I eat one everyday topped with a little peanut butter as my post workout snack…they give me the incentive to exercise! Thanks Mel!! These are so good! I only had a 1/4 cup of molasses, so I added a little over a 1/4 cup of honey. They are so good!! I’ll have to make them with all molasses next time! I love the crunch of the quinoa! These are great! I’m enjoying one right now…even my picky husband likes them. Will try them next time with some walnuts.
. . . BTW this recipe makes FIVE DOZEN mini muffins. WONDERFUL!! I knew I had to make these as soon as I saw the recipe. Bless you and Aunt Marilyn for sharing. My family loves these. They’re also great if you add some chopped nuts and raisins. Hi… What can I use instead of molasses??? I could’n find where I live… Please!! Anais – You will have to experiment – I haven’t subbed. Maybe honey, although it is much sweeter than molasses. Good luck if you try it! Made these yesterday….I substituted honey for molasses and they turned out great! My husband and kids love them!! my husband actually texted me when he got to work of how delicious they are without butter 🙂 And they will be great to just pull out of the freezer for next day’s breakfast! I also added a tablespoon of ground flaxseed just to give them some EXTRA power lol… I also made the cheesey ham and broccoli bites with the leftover quinoa. Thanks Mel!! Love these! I made mini muffins (a half batch made 24) and baked for 15 minutes and they were perfect. Jina – Certainly worth a try although I haven’t tried it myself so I’m not sure how the quantity adapts to a loaf pan. Good luck if you experiment! Thank you Mel for this recipe. These muffins are so tasty, especially warm! Suggestion for subbing out coconut oil? My little guy is allergic?! Look soo good!!! Thank you! Beth – You can go ahead and sub in butter or any other kind of oil (canola/vegetable) for the canola. I just made these, and they are delicious! Moist, just sweet enough, with that yummy warm spiciness that molasses and cinnamon provide. I love that they are chock full of goodness–I made a huge batch so I’ve got healthy breakfast and quick snacks for several weeks! And they are quite filling, thanks to a high protein content. Excellent recipe! Is the quinoa 1.5 cups AFTER it’s cooked? What kind of molasses did you use? 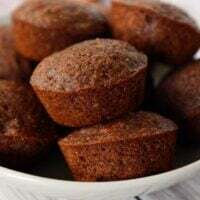 I used blackstrap unsulphered and these muffins turned out NOTHING like yours. They were really, really black, not browny goldeny like yours. We still ate them (no worries!) and the flavor was great, albeit really molasses-y. I really wanted these to work so we could have some yummy muffins to pull out of the freezer when needed, but they burned. 🙁 I followed the instructions exactly so I’m not sure what I did wrong. They baked 18 min (19 at the very most) at 350. Anyone have any ideas? I have a lighter colored aluminum pan and a coated darker pan that I used at the same time, but they burned equally in both of them. They were moist inside but burned on the bottom and outside. ???? Just made these; I didn’t have applesauce, but have lots of zucchini, so I grated it up in place of the applesauce and added a bit of stevia to make up for the sweetness the applesauce would have had. Ran short of molasses so I finished that off with sucanat. Worked great! These sound awesome! I’m so mad I went to Costco today and forgot to buy more quinoa, ran out last night. But these may be worth an extra trip. Picky toddler approved! Thank you SO much! 2 – This is probably a “duh” thing, but I had open containers of applesauce and molasses in the fridge, and those cold ingredients added to the melted oil caused the oil to harden back up before it was combined. Not a huge problem since I was able to re-melt the mixture, but it was a little bit of a pain. I know full well that room-temp ingredients are best when baking, but we all have to cut corners sometimes 🙂 BAD idea this time! I think we need a tour of your freezer 🙂 do you just freeze them in ziplock bags or what’s your system? Erin – I bake them, cool them, and then slide them into a gallon-size freezer ziploc bag and freeze them that way. Not sure my freezer is tour-worthy (it’s kind of a disaster actually!). And then how long do you microwave them after taking them out of the freezer? What gets them thawed and warm but not squishy? Thanks! Since I only had 3/4 cup molasses in my pantry I used honey to top it off to one cup. Very yummy….. Thank you so much for this I made these yesterday and am in love. I have a 2yr old who is underweight and anemic and she loved these. 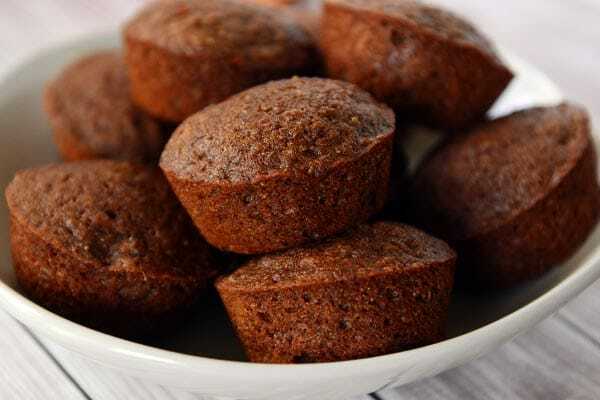 The molasses gives her a bit of iron and all around these are nutrient packed little muffins. She has never eaten a muffin before these. These sound wonderful. I’m a huge fan of your other muffin recipes so I’m sure these are as delicious as you say they are. I don’t have quinoa, though. I wonder if I could sub with cooked oatmeal? If I try it, I’ll be sure to come back and let you know how they turned out. Thanks for the recipe! These look like the perfect healthy muffin! And the carrots in them make me happy, as I’m always searching for ways to get veggies into my 3 year old! Pinning these and trying them soon, they look great. Do you think I could sub shredded zucchini for the carrots? Hi Kasey – I haven’t tried it but I think it could work quite well especially if the shredded zucchini is squeezed dry of any excess liquid. These sound super yummy and easily converted to gluten free! Is there a way to not have molasses in there? A substitute maybe? Carlie – you’ll have to experiment, I’m afraid, since I’ve only ever made the recipe with the molasses. A perfect recipe to help stock the freezer before school starts–sigh–summer is quickly disappearing. Thanks Mel! I would love to make these this afternoon. Would it be awful if I used regular white flour? p.s. i just made cinnamon coconut muffins with the crumb topping from your cream cheese banana bread added some coconut in the topping. Wowza it is fantastic! These will be great to make up and freeze to have on hand for a quick snack or breakfast, thanks. I have both molasses and quinoa to use up (had some, thought I was out and bought more….). Can’t wait to try these! My quest to banish Pop-tarts from breakfast has a champion! How do you freeze these (or any of your muffins for that matter)? Do you wrap individually in plastic wrap or just throw them all in a freezer bag together? i usually bake them first, then freeze them together in a bag, you can fit 9 in a gallon size bag. I like to put a couple in a sandwich size ziplock bag then put them in a gallon size freezer bag. I just reach in a get a bag or two and they are ready to go or warm and eat at home. These look so yummy!!! I make muffins all the time using soft white wheat flour or hard wheat flour that I grind myself. We love the whole wheat. Hi Shauna – I bake and cool them and then place them in a gallon sized freezer ziploc bag and freeze. You read my mind! I have been making and freezing muffins to serve at my daughter’s mission farewell brunch. I needed another option in the bunch and this is perfect! What would you think about honey instead of molasses (I’m usually not a fan)? Hi Carla, you’d have to experiment as I haven’t tried it but honey is much sweeter than molasses so keep that in mind if you make a change. Maybe start with half honey, half molasses? Can I use whole wheat pastry flour instead of white whole wheat (can’t find it where I live)? Yes, I think that should work just fine, Christina. If one uses butter in place of the oil, should it be melted or softened? And still 1/2 cup? Hi Kelly, yes I think the original recipe was 1/2 cup butter, either softened or melted.